Appartamento Primula is located in a quiet, panoramic area of Lovere and offers a splendid view of Lake Iseo and the Porto Nuovo. The apartment consists of a spacious living room with lake view and a single sofa bed, with access to the balcony overlooking the lake, where you can eat outside and lie down to enjoy the sun and the lake air. The separate kitchen has a fridge, freezer, kettle, coffee maker, juicer and many cooking utensils. Also there is an elegant dining room in a separate room, with six seats. The sleeping area consists of a bathroom with shower and washing machine, a bedroom with three single beds and a double room with lake view. 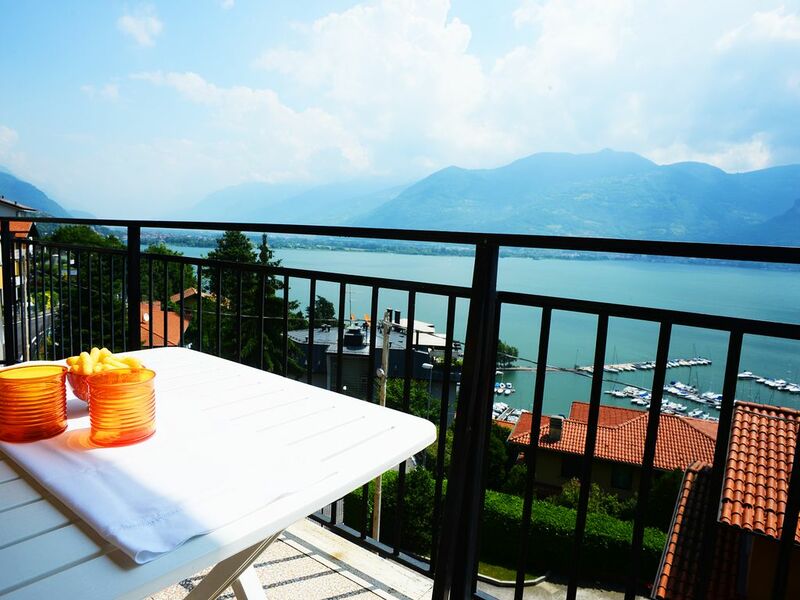 Appartamento Primula is located just five minutes walk from the new port, where there are some sports areas, such as basketball, football and tennis courts, as well as a playground and a small water park on the lake, with a swimming beach . With a walk of about ten minutes you can also reach a supermarket and the historic center of Lovere, one of "The Most Beautiful Villages of Italy", where are placed various services, such as restaurants, bars, banks, pharmacies and shops. The Primula Apartment of Sweet Home Rental is a nice flat to stay in with magnificent views from the balcony. The apartment was clean and very spacious though simple but functional. Its on the 3rd floor of the building. It’s located on a hill in a quiet urban area of Lovere. There’s a garage where you can park your car, but if it’s too small you can park your car in front of the garage. A 5 minute walk down the hill brings you to a small harbour where there are a couple of restaurants and bars and the public (paid) pool of Lovere. From there it’s a 10 minute walk to the centre of Lovere which has a great atmosphere and some good restaurants. The ice-cream of Artigiana Gelati (Via G. A. Gregorini, 10) has some of the best ice-cream we ever tasted! We spent a wonderful 2 weeks and really enjoyed our time in Lovere. On arrival Roberta provided us with some food for breakfast since we arrived late. From the start, communications with Roberta were fast, friendly and accurate. We really enjoyed our time in Lovere! The lake and small towns around the lake are beautiful. On the north side there are several small beaches which are not always easy to find. If you drive south towards Riva di Solto for 10 minutes there’s a parking spot just before Riva di Solto where you can walk back north for 5 minutes and find a nice area to put your towels and swim in the lake. When evening falls you can also drive to Pisogne (10 minutes) on the other side of the lake where you can watch the sunset from one of the restaurants. Highly recommended! We also enjoyed a nice boat trip with the ferry to Monte Isola where you can hike to the top and find the sanctuary of Madonna della Ceriola with an astonishing view of the lake. Milan is about an hour drive and Brescia and Bergamo are also worth visiting. Up north in the valley (20 minute drive) there’s a waterpark called Acquaplanet in Boario Terme which is great for kids. Thank you for spending your precious time writing a review, I appreciate it! it was very nice for me host you, I really hope to see you again in the future! thank you for spending your time to get us a review! We will immediately supply the cutting board kitchen. immediately, I'm sorry you had to sleep in another bed. we will resolve the problem as soon as the current guests leave the apartment.